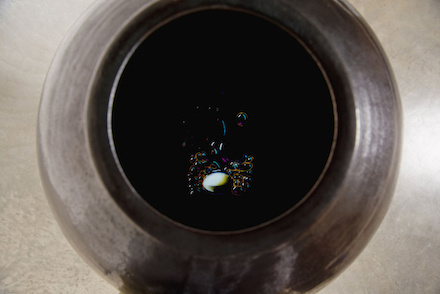 On view at Lisson Gallery in London is a new series of works by Swedish video and installation artist Nathalie Djurberg accompanied by soundtracks made by Swedish producer and performer Hans Berg. The works will remain on view through November 1st. In one room, 10 waist-high urns stand in two rows. 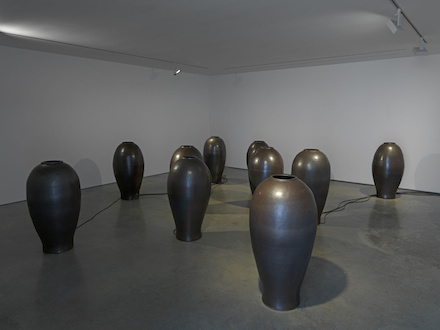 Entitled Gas, Solid, Liquid, each urn is fitted with a unique animation relating to possible contents, and a specially composed piece of music vibrating within each vessel. The works, by their peculiar, internal focus, become spaces in their own right, defined by a series of environmental conditions that separate them distinctively from each other despite their common forms. In another room, light, projections, and bass-heavy music make a series of installed tables appear to dance. 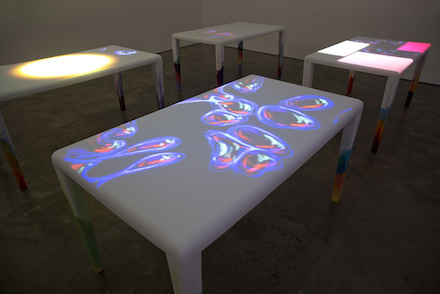 The sculpture project, entitled Fever Dreams uses the surfaces of the tables as projection screens for footage of amoebas, amorphous matter, and clouds liquefying back to rain and before gradually becoming seawater. The exhibitions’ namesake piece, The Gates of the Festival, focuses on Berg’s compositions, which have provided the foundation of Djurberg’s works for the past 10 years. 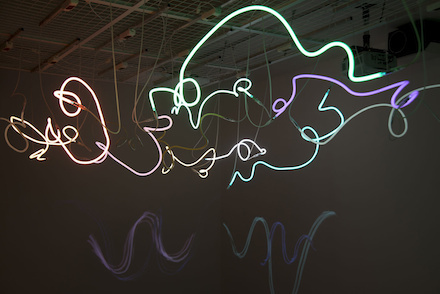 Composed of 12 neons curved in lines suspended from the ceiling, each representing tones programmed by Berg, the shape of the sound seemingly determines the visuals. 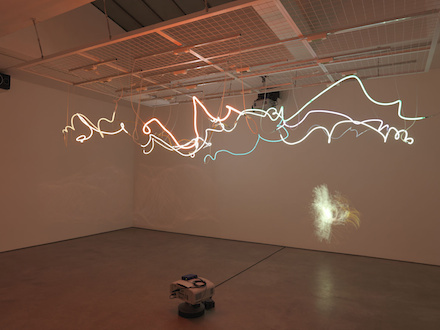 Each frequency corresponds to a different action (created by Djurberg) – such as, a claymation bird in flight, or crayon-drawn video animations moving across the walls. In this way, the sounds seem to be “playing” the installation rather than remaining in the background. The interactions and relations presented here create a striking impact on the viewer, underlining the raw materiality of sound in and of itself. 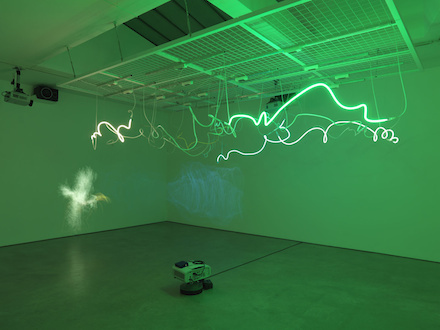 The vibrational capacity of sound as moving columns of air is given notable credence, providing space for the sound itself to make a tactile impact on the presentation of the work as a whole. 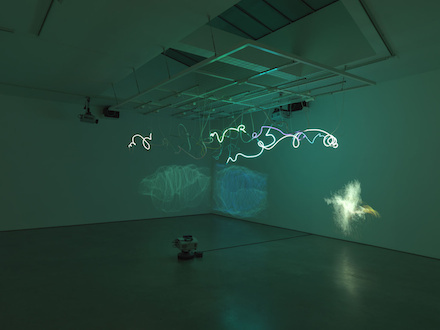 The Gates of the Festival exhibition will remain on view at Lisson Gallery through November 1, 2014. 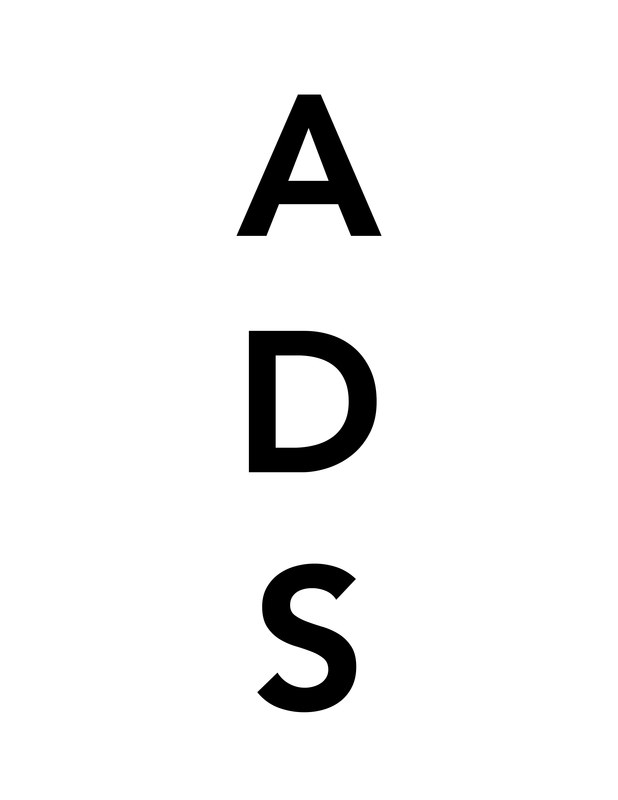 This entry was posted on Wednesday, October 29th, 2014 at 6:00 pm	and is filed under Art News. You can follow any responses to this entry through the RSS 2.0 feed. You can leave a response, or trackback from your own site.